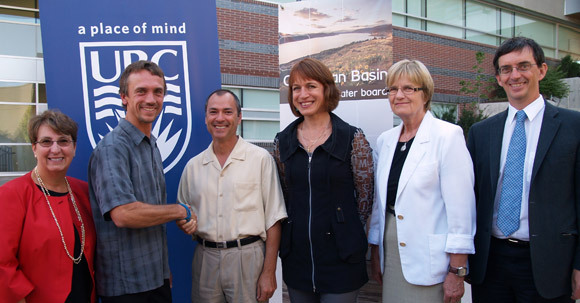 In the first of a five-year commitment by the three regional districts, the OBWB contributed $100,000 in 2012 to support a Water Research Chair at the University of British Columbia – Okanagan. These funds triggered more than $1.5 million in contributions from the Province of B.C. and the Real Estate Foundation of BC. As in other years, in 2012 the OBWB received substantial financial contributions from senior government agencies for water management initiatives, totaling more than $276,000. These funds more than double the OBWB’s budget for water science and policy projects, and among other things, supported drilling for groundwater monitoring wells, building the BC Water Use Reporting Centre, and creating the Okanagan Hydrometric Connectivity model to help manage water shortages. OBWB also received several grants from Natural Resources Canada to continue work on climate change adaptation, including a series of Tools Training Workshops for local government staff.